Babblings of a Mommy: Fall Expectations. We're only a few weeks from ushering a new season. Can you believe it? The mornings have just started getting cooler and I simply can't wait for the fall season to begin. Autumn has always been my favorite time of year - but this year I'm especially excited to experience my first fall in New York! Growing up in Chicago I got to experience all 4 seasons thoroughly, but after spending almost 9 years in Florida, I really started to miss seeing the turning of the leaves, and feeling that cool crisp air that only comes from the fall. Also, with the changing of the seasons, of course means the changing of our wardrobe - and I for one, can not wait! 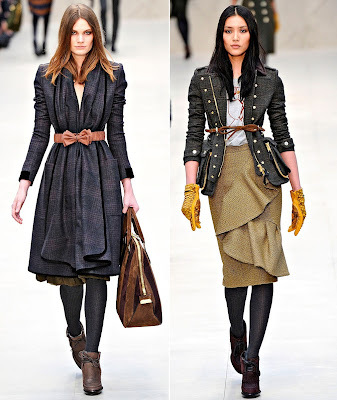 I just adore everything about fall fashion! So for a little taste of fall, I leave you with pics of Burberry Prorsum's Fall 2012 Runway show which encompasses everything I love about the season. I can't wait for fall! GA is warm too but I will be wearing boots come September! These are some cute looks! i want that navy and tan striped skirt! can't wait for fall! I love these fall preview shots. I save a few for inspirations. Ooh how I'm looking forward to it! 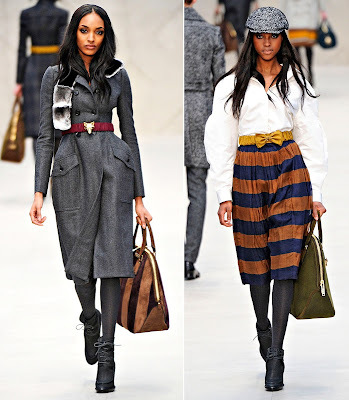 Love the bow belts! Ooh how I'm looking forward to it! Love the bow belts. Oh Lord!!! I have a trench coat of my mothers that I found after she died. It is a little too big but looks very similar to one of the photos above. I was a little stumped as to what to do with it but I think I am going to use this as inspiration and have it tailored to fit.